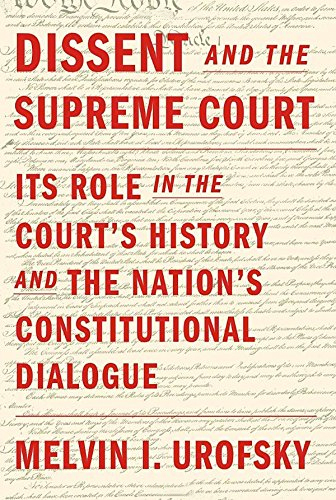 A book which looks at the role of dissent in the Supreme Court and the meaning of the Constitution through the greatest and longest lasting public-policy debate in the country’s history, among members of the Supreme Court, between the Court and the other branches of government, and between the Court and the people of the United States. Urofsky’s extraordinarily careful analysis and sense of historical depth make ­Dissent and the Supreme Court an important book, one that explores some of the most significant dissents in the history of that institution. His new book, Dissent and the Supreme Court, masterfully recounts the history of dissent on the court, from its earliest days, when dissents were rare and strongly discouraged, to the modern era, when they often outnumber majority opinions. His book is a fascinating—­if at times dry and encyclopedic—­tour through the Court’s dissenting history. What did you think of Dissent and the Supreme Court: Its Role in the Court's History and the Nation's Constitutional Dialogue?